I have nothing to give my friend Rafi saab except a few thoughts. A tribute to the maestro on his 31st death anniversary. In your memory dost, a humble submission of my ego—here I go. I started packing my dreams.They were in myriad hues; some black and white, some in eastman colour, some resplendent and some in shades of grey too.The wrapper was soft and velvety like the thoughts that constructed my dreams.Then, there was a sash which kept them intact,a sash made of pure love and tied with the most intricate of feelings .The bundle was attractive,the contents of the bundle even more so. I set off to a world unseen, unheard of, holding the bundle close to my heart, like a baby being cuddled in the cozy haven of its mother’s arms, like a man being held snugly in the warmth of his lover’s embrace,like a sibling being protected from his foe,as if a long lost friend was back and was effusively being hugged, as if all relationships in this world had only one name, that of my idol– Mohammed Rafi. On the cover was inscribed—DOST- -I MISS YOU, in bold striking letters. Inquisitive eyes hovered over the letters and asked—Who? What? When? Why? How? Where? The smile on my lips, the luster in my eyes and my ecstasy, they spoke. Silence can be overpowering at times. Dreams dreams and dreams—were the contents of the bundle. Some of them had entered the REM state, some of them handpicked and some of them sown. Some of them saplings, some of them mammoth aspirations, some larger than life images! Some of them raw and some overripe ! Some of them in solid state some liquid and some in ethereal form. Some of them complete,few of them aged and some in a state of uncertainty ,all packed in one to make a heady concoction! I got into the mood elevator to the 7th heaven! I reached my destination. to see the world of fantasy unfold before me. I opened the bundle.It contained so many sachets with different names — The lover, the parent, the teacher, the leader, the protagonist, the Lord, the psychologist, the guide, the researcher, the healer, the patriot, the artist, the sculptor. All roles rolled into one. This was the omnipotent, omniscient singer Rafi. Inside each sachet were immortal melodies so painstakingly rendered to suit every phase of life. I savored them one by one. The thirst was insatiable.. I longed for more. This all rounder of a friend, this sovereign of sur had been with me through thick and thin and continues to be. “Continues to be? Only in memory”, a voice ridiculed.. The stony silence mocked at me. My dost had left this world to appease the higher Being.. I was jolted back to reality. I plodded onwards wearily, the bundle seemed heavy and my heart heavier. Groping my way in the darkness that engulfed me I set off , in search of another dost. Nowhere could I find any. This void will remain a void, my inner voice mumbled in mockery. My dost had pitched a permanent tent in my heart. He will always remain mine and I his Vasudha_babbi @ yaaaaaaahooooooooooo.. This entry was posted on Sunday, July 31st, 2011 at 4:49 am	and is filed under Meri Awaaz Suno. You can follow any responses to this entry through the RSS 2.0 feed. You can leave a response, or trackback from your own site. 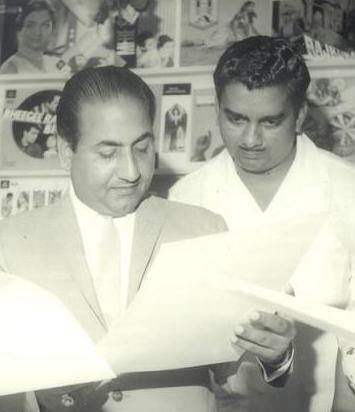 mohammed rafi sahab looking so cool and cute in this pic., i love his all-over personality. and miss all time and all life. What an article, almost a great tribute to Rafi Sahab. I read and re-read so many times just to know how rafians love and adore Rafi Sahab. It is just wonderful article, amazing and superb. Please keep your pen in motion to flow some more pearls like this article. I am glad you liked my write up.Main aisaa hi hoon nawathejee main aisa kyun hoon maloom nahin.I find it difficult to give a direct report about anything.I have to think from a different angle.I am so happy you liked my presentation–I will try writing more often. A man with profound knowledge, a singer ,a writer,an intellect -all in one –I fall short of words to thank you. Thanks ASM -very very much .It is your good wishes and support that is making me write. You are my guiding light. whenever you dont read what I write I miss you a lot.Now that you have found time to read I have everything in life.It feels really good and I feel complete. Thanks a lot sir.Rafi’s magnanimity is worth a thousand praises.Thanks for sharing. It is an exhilarating experience to read comments from a devout Rafifan like you.Thank you very much sir.Will try writing more. that was a unique way of paying tribute to the legend. And you have done it yet again in your inimitable style. Made fantastic reading. Loved the thought and your style. Bahut khoob. What a Dil Se sweet poetry on your love for our Farishta… You have expressed and represented all devotees of our icon so well..
Binuji, that is a wonderful anecdote to relate. Such benevolence is indeed not found every day. Thanks for sharing the story. Dear Vasudha ji, just read the write-up from facebook link and i couldn’t help but leave behind a small note of sincere admiration. the way you have placed your dreams, your love and your admiration to rafi is just awesome. hearty congratulations. long live rafi…. Vasudha ji… was busy in july so my late entry and delay in complimenting your write-up. well done. one more story of mohd rafi benevolence. a true account from sharad vaikool mohd rafi friend. after the lunch on a lazy sunday, our own tansen was relaxing when a persons voice was heard outside his home window. mohd rafi came down who this singer was along with Sharad vaikool. the man was in fact singing asking for alms. mohd rafi told him: u are singing wrong and u must sing your tune like this. the man got a bit excited and asked mohd rafi : “who are you to tell me this. i am begging for my stomach. mohd rafi then asked him :”why cant u work? why are u begging like this having an able body?? the man extended his hands and showed mohd rafi his ruptured palm without fingers. sir, i cant work the man said. I was a singer he added but when bad times came, i found a job at a factory. there i had an accident and lost my fingers. mohd rafi was moved. and asked the man : where he stayed? he stayed somewhere near a pipeline he mentioned. then and there mohd rafi took the man in his car along with sharad vykool, went to his zopada , in slum land, put his belngings in his car and brought him home. then he asked the man to work in his house as the watchman. how many of us or an singer do this?? as we all say, a mohd rafi will come only once in thousand years. Finally I found time to read your article.Good one.Great work.In future I will try to find time to read such articles.Good luck dear! wow – is my only comment ! The thought is great and so is the ending. When things start well and end well, then the journey should be pleasant..
Write more – You have an excellent way of communicating your thoughts..
Really superb….Wah- sudha ji, I could find the real expression from the heart …In fact the title itself reveals everything and one can easily think of a masterpiece writeup on the way. Two of the best articles that I have read today are by two of the best people that I know. Achal Rangaswamy and now Vasudha. Fans of Rafi Sahab are now truly vying with one another in expressing their true love for Rafi Sahab and how well they can. I have never read better write ups on an idol by a fan. Mark my words friends – the fans of Rafi Sahab are simply beyond the normal. Vasudha, you are on top of such an illustrious list with your easy flow of writing, which carries readers like us on a heavenly journey. We had all known Vasudha the great writer earlier too. We all had known Vasudha, the great Rafi Bhakt that she is. What we are discovering are how well Vasudha can articulate her feelings. This is the best compliment that Rafi Sahab could get thus far – the best of prose writing by an ardent fan. Vasudha, you have done a marvelous job in paying your richest tributes to the king of music. Start a journal – The Rafi Weekly – which will cross the combined sales of all the national newspapers put together. Thanks a lot for such a lovely presentation of your thoughts. Made my day. I have decided to treat my patients with Rafi songs,sung by yours truly, what say?Thanks a ton for the praise.I am bloating,er floating! Thanks a lot.Keep reading other articles on this forum. The artist Rafi can bring out the best in everyone.He is my inspiration.And with friends like you to back me up its a total celebration.Romba romba thanks. See the power of Rafi.I thought you had forgotten me and you spring a pleasant surprise by your heartfelt commentsTo know that my write up has been read by veterans like you is itself an exhilarating feeling.Thank you,Thank you. Your comments surpass my write up.Too good.You should write more often. You are always with me sharing my joys and sorrows,editing,correcting my pronunciation and helping me improve my hold on the language.I am not going to thank you you deserve a big fat hug!! Farmaayiye–Aap joh bhi kahenge main likhne ki koshish kartee hoon.waise mujhe hamesha log zara hatke vasudha kehte hain–maloom nahin kyun. I feel good when I write hatke articles.Thank you so much sir. Your fantastically scripted piece was just awesome. Didn’t know we had yet another hidden talent amongst our midst. The lover, the parent, the teacher, the leader, the protagonist, the Lord, the psychologist, the guide, the researcher, the healer, the patriot, the artist, the sculptor. All roles rolled into one. This was the omnipotent, omniscient singer Rafi…. Couldn’t have been said better…….I expect more such hatke and out of the box write-ups from you. Hitherto I’d say ‘ why dream things that never were?’ and upon reading this my inner voice now says ‘ why not?’. wonderful words of imagination straight from your personal laboratory. your deep love for rafi couldn’t have manifested in a better form. Rafi sab that I’d cherish for long. This beautifully written piece is ample evidence of how devout a fan you are of the legend that is Mohammed Rafi. Yes, there will never ever be another like him. Thank you for sharing your thoughts and transporting me to another realm, albeit for a short while. Oh my god……… Every time i feel that i have seen the best from u, u surprise me more the next time. As a doctor u r in the wrong profession vasudha. Loved ur play with words and passion for ur and our dost. keep writing my friend…. we all have lot of fun reading. You have beautifully encapsulated the greatness of Rafi Saab in what may be described as one of the most sensuous tributes to the legend that is Rafi. Mohammed Rafi is like a shadow which never leaves your side, rain or shine. Whether you are floating on a cloud or in the abyss of sorrow, the melodies of Rafi Saab prove to be a mood stabilizer. The question of missing him is just not there because he has been immortalized through his innumerable numbers. Million megabytes of space will not suffice for his eulogy. Kudos Vasudha I can very well imagine the depth of your admiration for the master singer. Dear Vasudha:Thank you for a wonderfully intrically woven and ‘packaged’ gift.Yes,Rafisaab was a friend,philosopher and what-all rolled into one.It is impossible to find another like him in our life-time,nay,never.We live with his memorable songs and in the hope to catch up with Him in the other world. this article is beautifully written and the expression is clearly that of a devout fan and lover of music. you have peeled off layer after layer of emotions to bare your inner most feelings for your idol and “dost”. A touching tribute to the great legend.May his soul rest in peace. Bahut khoob, We all miss Rafi sahab. yes – rafi sahab is your dost – and how true none can take his place.